Well here we are plunging along into a brand new decade. Last year the olâ€™ rust bucket was forced to stay in the barn due to various issues, including the inability to justify dragging it or myself out to the desert. But this year is looking up! My sanity has lapsed just enough to make me think that Contraption upgrades and driving west are both good ideas. It must be made clear that the product is far form the entire work of art. You see, as I began documenting the progress of the project in the very first Contraption thread, it quickly became something more than Iâ€™d ever expected it to be. And Iâ€™m not referring to the number of responses the thread got, but rather the depth of the stories that emerged. There was a lot of people pitching in thoughts or helping to trouble shoot an idea, but every now and then something more was teased out . Out of the rusty junk that was being pieced together came the memories of people who were touched by the project enough to share their own experiences. The thread itself became an interactive art piece that grew and revolved around, making me look at the project in a whole different light than Iâ€™d expected. 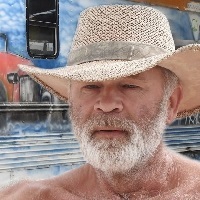 Can't wait to see you and Karine on the playa this year. Thanks Risky! Weâ€™re looking forward to sitting around and enjoying the evening with you, as well. Itâ€™ll be nice to be on the playa again. Hopefully the year will turn out the way it looks like and weâ€™ll make it. Weâ€™re sure planning like we will. #1) A two speed transmission. The plan is to have a granny gear for moving around near crowds, Esplanade or around large art pieces for instance. This should allow travel at around 2 mph. This is a bit less than the speed we had in 08 and that worked well for crossing intersections and moving around crowded areas. 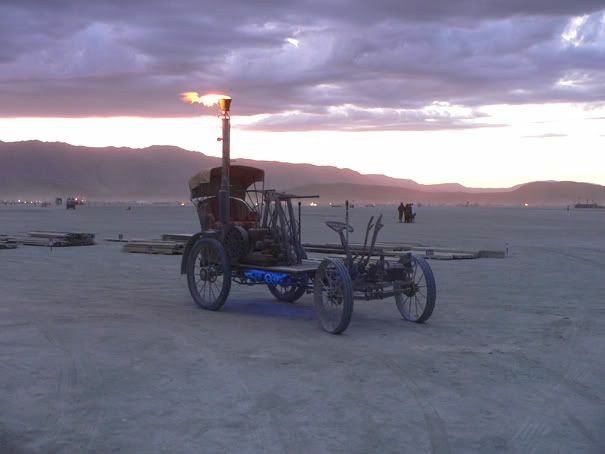 However once out on the playa it was slow going, so a second gear will allow us to travel up to 5 mph, maybe more if DPW tries to commandeer us again and we have to make a break for it. But of course the speed limit in Black Rock City is 5mph, so thatâ€™s what weâ€™ll do. Itâ€™s just nice to know that if we have to make evasive maneuvers to spare innocent lives, then we can in a pinch. So far the transmission looks like it will be able to shift on the fly, but tests will verify this later. 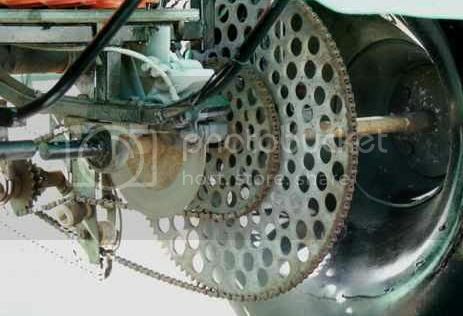 #2) A working reverse gear. The only reverse The Contraption had before was hand crank and really more for looks than function. You could push it much easier than you could crank it. The new reverse gear was at first going to be a third gear on the transmission, but Iâ€™ve opted for a more aesthetically appealing approach that fits with my vision of the Metropolis theme, that being cogs and gears. #3) Last, but certainly not least, a new engine. The old 1928 1-3/4 Hp Hercules that powered her in 08 worked but was really weak. It was maxed out when it ran and sometimes it did not fire up at all, leaving us stranded and having to push the old girl home. As Fishy noted in another thread, this was ultimately a great memory, but not something I wish to do twice. The next power source that is planned will be a 12 Hp diesel engine that is fitting in design for the machine and should be easy to punk into shape. This new engine is the lynch pin of this new stage of the project. Without it coming through, the rest is of avail, so Iâ€™ll keep the thread posted on that aspect especially. The one point of hesitation I have over this change is the breaking of sorts with the use of primarily old or made stuff. I think Johnny Payphone almost disowned me over placing an antique internal combustion engine on it, instead of the original motive method of pure human power. I only hope after a new engine heâ€™ll still find a way to look at me without disgust. Go LeChat! I've always admired your creative and community spirit. Great to follow along once again and know that we are wrenching shoulder-to-shoulder through this mysterious linkage! Anyway, given two things about the Contraption I know, 1. It's getting a bigger better engine, and 2. I know the DMV wants you to put a lot more lights on it (mine too) I thought I'd remind you about what I did that worked out well to make lots of electricity for cheap, without having to run a generator. Go to your local junkyard and grab GM "CS130" alternators. They came on late '80s - early '90s smaller GM cars, which are plentiful in junkyards. The deal with these is they put out LOTS of current at idle speeds, while most alternators only make anything near their rated output at high RPM, which playa vehicles never see. I have two in parallel on my Yacht and can sustain a 1000-watt 120VAC load through a cheap inverter. And yes, contrary to what I have read, you can run several in parallel, I tried it, it works! When you read about these units online you see people saying they are expensive and un-rebuildable, but I pay about $10 a piece at the wrecking yard and have only had one fail on-playa after 4 years, no problem at all because you can just bring spares. Run a Contraption-belt over to a few of these and you'll be able to run all the lights you want, silently (other than the sound the Contraption already makes) and seamlessly, for cheap! Light that baby up! Youâ€™re right. That should have been upgrade #4 actually. More lighting. There, now itâ€™s official. This is a part of the project where Iâ€™m really asking for community input. The power source isnâ€™t a big issue. I already have an alternator on there already, an AC Delco that puts out around 45 amps at the lowest rpms its rated for. I canâ€™ t remember exactly what rpm that is off the top of my head, but thatâ€™s just a matter of pulley size to get it where I need it. And I did not know about running them in series. The 12 Hp engine should have power to spare considering the low gearing on the drivetrain. My conundrum is that I could easily put a bunch LEDâ€™s and rope lighting on and say that itâ€™s done. But thatâ€™s not the look Iâ€™m after. My initial thought is more indirect lighting pointed towards the mechanical workings and the playa. This is easy enough, but I know that the DMV wants to see the whole thing lit up more. Thatâ€™s a bit more difficult to pull off in a way that seems appropriate. There seems to be a fine line to walk between too little lighting and just another glowy thing. I feel that this vehicle deserves something a bit more thought outâ€¦ something a bit more period-styled and fitting. I guess this calls for some antique LED lighting! The headlamps need a rework. So far Iâ€™m thinking Iâ€™ll rebuild them to look like large carbide mining lamps, each with a 32 bulb LED lamp. Perhaps in Amber for a bit more character, but if not then maybe a warm white. Easy enough. But illuminating the rest of it is going to be the challenge. Ideas? ETA: After re-reading your post, the thought of an alternator just idling and not whining along at 2500 RPM is very appealing. Iâ€™ll check into those Captain. Good idea. And yes, the whole idea of the contraption was a 10 fold gift, even before any of us seen it with our own eyes! Mister Jellyfish Mister wrote: Go LeChat! I've always admired your creative and community spirit. Great to follow along once again and know that we are wrenching shoulder-to-shoulder through this mysterious linkage! From you that is a true compliment. I am proud to wrench shoulder to shoulder with you, sir. So I've been thinking about the little diesel. One of the machines I work with is one of those off-road forklifts that are carried on the back of a big-truck. It has a similar small diesel, and you might wanna do what I do, run either pure veggie oil or at least biodiesel in it, not for environmental concerns, but just because the exhaust will smell like french fries, instead of like... diesel exhuast! The compression ratio of the one Iâ€™m looking at is 20:1 and that is high enough, as I understand it, to run veg oil without problem. Youâ€™d still have to start on diesel, but once the veg oil came up to temp you could switch over and there are numerous ways to heat the oil, either with the exhaust or with the heat from the evaporative cooling tank. I find that just running the commercially available "biodiesel" (mostly regular diesel with about 10% or so veggie mixed in) is a significant improvement in air quality in the vicinity of the machine's exhaust, if it ends up being any hassle to go 100% veg. Have you tried it in your Dodge? Woohoo! The Cat is back! In honor of the occasion, I'm typing this with a cat on my lap -- my neighbor's "Great Gray Hunter" (she fancies herself!). It looks like I am motorizing a Grand Piano for this year's burn. My first thought is a big single cylinder motorcycle engine -- a "thumper". But anything is possible. I'm scheduled to pick up the Grand this Sunday. If I don't get to ride on that old corn binder this year.. There's going to be hell to pay..
We can ride it and eat french fries ! Man, I'm going to be deep-frying a LOT on the playa this year, I'd be guessing. unjonharley wrote: If I don't get to ride on that old corn binder this year.. There's going to be hell to pay.. Does dragging behind count as "a ride"? In all seriousness, this is one of the reasons why I want to make it this year. I don't need any more payments to that particular creditor. Here Here Le Chat and Karine and the beloved Contraption, Welcome back Home! Thanks Pinemom!!! it's nice to be thinking on Contraption stuff again. It let's my mind decompress. On the top, left to right, is the Actuator, Sliding Key, First gear, then Second gear. At the bottom is the shaft it all rides on. Check out the links I posted recently on the LED thread. And I know of a hotrod shop with unusual lens conversions too. Most issues can be solved with the wide angle luxeons though. Call me for help with anything more exotic like HID colored lamps. I still think heavy alternators designed for high output at idle are better. They actually rate them at idle. Guilt triping you like a good jewish gradmother.. The shift mechanism on this one was a hollow shaft with a protruding slot, as opposed to your keyway. 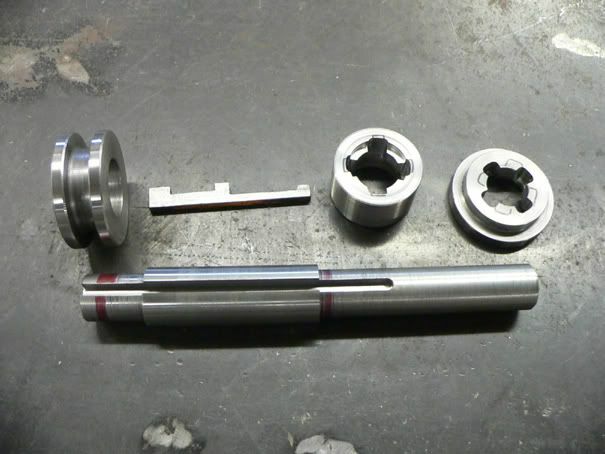 The hollow shaft facilitated a simple push-pull rod/knob for control -- no need for a shift fork and actuator sleeve/collar. Those components looked lawn-tractor-ish in size and style. And now you are building one from scratch! Fantabulous! Can you build me ten four-speeds in time for the Kinetic Grand championship in May?! With 2000 % range between low and high, please. My latest thought is to use chain gangs with individual inputs (with freewheels), and those inputs (from pedal power) can be bicycle chain, shifted by bicycle derailers. The trick, which I recently dreamed up, is to move the chain between two different shafts. Oh... Chain gangs were somewhat common on British motor vehicles 100 years ago. Very appropriate! The fact that you are almost into a new shop is wonderful. That is a great thing that will lead to more great things. I owe you for the inspiration of this new transmission. Those very pictures that you posted have been saved in a folder on my desktop for a long timeâ€¦ since you set them to me or maybe posted them before. I canâ€˜t remember other than I know you were who made me aware of them. Either way, I studied them intensely many nights and made notes and drawings. So what you see in the photos I posted is the result of the inspiration of what you put out there some time back. Without those pictures I wouldnâ€™t have had much to go on at all. So Elliot gets the credit for getting this one started! carbide lamps? or carbide looking lamps with leds inside? Carbide looking lamps with 32 bulb LED lamps is what I'm thinking currently for headlamps. I can form the metalwork for the lamps easily enough. It's the lighting the rest of the rig up that is stumping me at the moment. I like your find much better, Elorrum. It looks awesome, and I love your aesthetic. I read through all of the old thread a couple months ago. What kind of diesel engine? I love the small two stroke diesels, like they use on small canoes in Indonesia. The hand crank start and loud 'bap-bap-bap-bap-bap-bap' that must only be a couple hundred RPM as they chug along. For lighting... If would be cool to have that flickering intense warm light of a coal furnace on an old train. Maybe you can simulate that with a couple RGB DMX type LED lights with appropriate programming, or maybe a single light with a computer fan blowing mirrored mylar strips in front of it. Put that inside an aged metal box that has a few glass port holes or access doors, for an intense light that just pours out of it in different directions, like the way light comes out of the designs on a burn barrel. Or maybe that's too high tech. You know, when I was sailing with very little electrical system, I would hoist a pump up kerosene lantern into the rigging when I was in narrow channels with a lot of fishing boats. It has a stark white light that has a quality that is completely different from the warmth of a propane camping lantern. 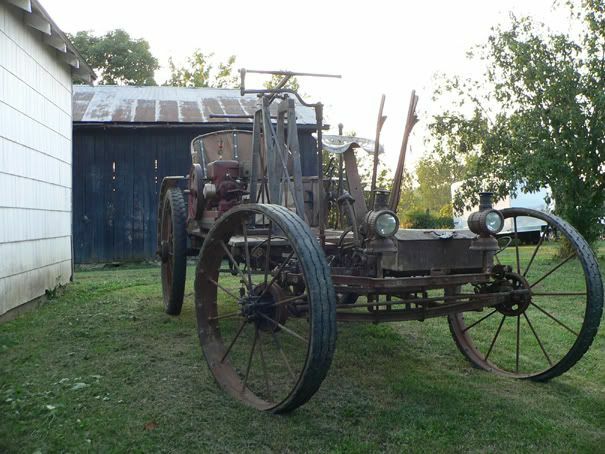 It would fit the agricultural equipment vibe. It did have a lot of glare, so you'd have to do something creative with the lens or louvers to try and project it out above eyelevel or down low-- maybe a fresnel lens that looks like it should be in a lighthouse. But it would last for about three hours before needing to be pumped up again, and worked reliably in a lot of wind. There is something compelling about the quality of non-electric lighting. I know where you can get some from Rhine boats. I just saw Jake Von Slatt on the Make show, make a lamp from two brass wine goblets by cutting off the bases and joining them. He used glass jewels for lenses, like the ones in the side markers by ron francis that I use. Why a 32 LED source? Do you already have them? Most multi-source LED devices have narrow angle light and directional issues. They also had a hydrogen peroxide powered steam engine prosthetic. And a pulse jet bike.